The emergence of wisdom tooth normally occurs between 18 to 24 years of age. The prevalence for at least one impacted (which the path of eruption of the tooth is blocked by another tooth or bone which therefore prevents it from assuming a normal position in the mouth) lower wisdom tooth is 72.7% in an age of 20 to 30 years. An impacted tooth is not a disease in itself but is considered an abnormal state. However, not all impacted wisdom teeth need to be removed. Surgical removal of wisdom tooth in absence of wisdom teeth pain or any other signs and symptoms is not usually indicated. However it should be monitored from time to time by clinical examination and x-rays. Decisions about surgery vary widely. Before wisdom teeth removal is done, the tooth is assessed through x-ray(s) or radiograph(s). 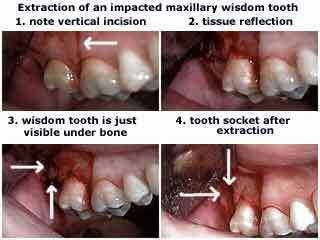 A simple impacted wisdom tooth can be removed by a dentist or dental surgeon but should the wisdom tooth removal be complicated due to certain factors, the procedure is usually referred to an oral maxillofacial surgeon. A consent form will be given and you will be required to sign it before the surgical procedure is performed. If you have any doubts, ask your dental surgeon before placing your signature. You will be asked to rinse your mouth with an antibacterial mouthwash to reduce the amount of bacteria in the mouth. Anesthesia is given. Ensure that you inform the dental surgeon of any medical conditions you have to avoid any complications later. You can opt for local (loss of bodily sensation without loss of consciousness) or general (loss of bodily sensation loss of consciousness) anesthesiathough the latter is normally given when more than one wisdom tooth is to be removed. 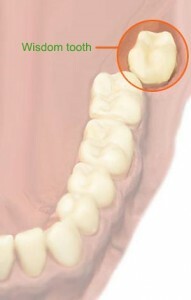 The gum flap surrounding or over the wisdom tooth is opened up or elevated to expose the tooth. Bone around the impacted tooth especially on the sides and the back of the tooth is guttered using a round bur. According to the type of impaction the tooth is taken out with or without splitting the tooth. Tooth is removed or elevated from the tooth socket using elevators. The leftover socket is cleaned and washed. The gum flap is stitched back or sutured using a non-dissolving thread. An appointment is scheduled a week later to observe healing and remove the stitches. 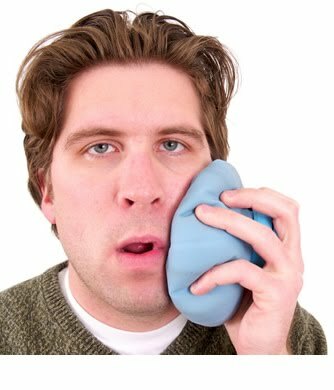 Bite on a gauze pack as instructed by your dental surgeon for about 30 minutes. If bleeding still persists, replace the gauze pack and repeat process till bleeding stops. Avoid talking during the process. Stop smoking as it can delay healing. Ensure that you finish the antibiotics prescribed to you. Avoid eating till the numbness of the anesthesia has faded away. Avoid hot or spicy food as it can result in bleeding. In addition, soft diet is advised. Avoid biting the lips or cheek when numbness persists.